The new 36,742 seat capacity stadium of the Miami Marlins, Marlins Park, opened for its first sporting event on March 5th, 2012 after breaking ground in 2009. 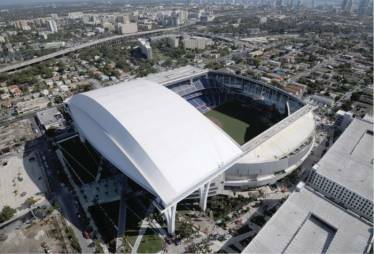 Following a growing trend in new Major League Baseball stadiums, the Marlins Park was designed to have a retractable roof that would shield the crowd from inclement weather and scorching sun of a Miami summer. The roof consists of three large panels that all may be moved independently of each other to create partial or total shade for the crowd and players below. The mechanical system that moves the structure is composed of 44 transporters, each equipped with 88 wheels that measure 36 inches in diameter and another 8 wheels that measure 15 inches in diameter. Acting like a train, the transporters move the roof at a speed of 39 feet a minute with a total travel time of 13 minutes. Due to the massive size of the roof structure, its mobile nature, and the high winds it could experience during hurricane season, there were extensive safety features built into the roof including automatic clamps and a number of tie downs to hold the roof in place during a weather event. Portland Bolt was selected to provide 3” diameter and 4” diameter galvanized F1554 Grade 55 threaded rods that would have #8 and #7 clevises assembled on each end to form a total of 56 tie rod assemblies. The tie rod assemblies would form tie downs that would hold the roof in place and provide an added level of safety in addition to the other designed safety features. Due to our expertise at creating large diameter threaded rods and our ability to quickly hot-dip galvanize large threaded rods in-house while maintaining a quality thread and fit, Portland Bolt was selected to provide these critical parts in an expedited time frame.